Xiumin and his staff's text messages gathered great interests of the public. 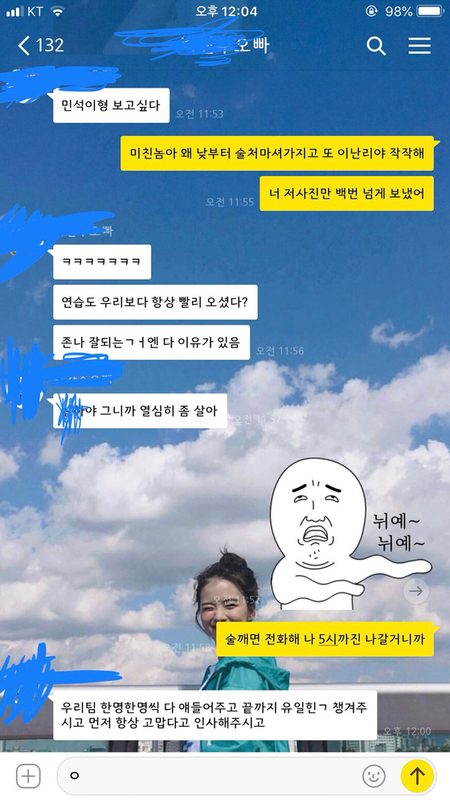 One netizen posted a screenshot of her text messages exchanged with her close friend (oppa) on the online community, with an explanation "One of my close acquaintance talks about Xiumin everytime he drinks." This anonymous 'Xiumin lover' is presumed to be a member of Xiumin's dance team who went on the stage together. He was being overly affectionate by calling Xiumin by his real name Min Suk and even having his profile photo taken together with Xiumin. But this is my first time talking like this, right? Writer: Gosh. Okay, I get it. But do you recognize yourself talking about him for a month? Writer: Yes yes. You said it yesterday too. Stop talking and send me the thing I asked you before. Writer: Hey crazy dude, why are you doing this again? Are you drunk at this time? You sent me that photo more than a hundred times. 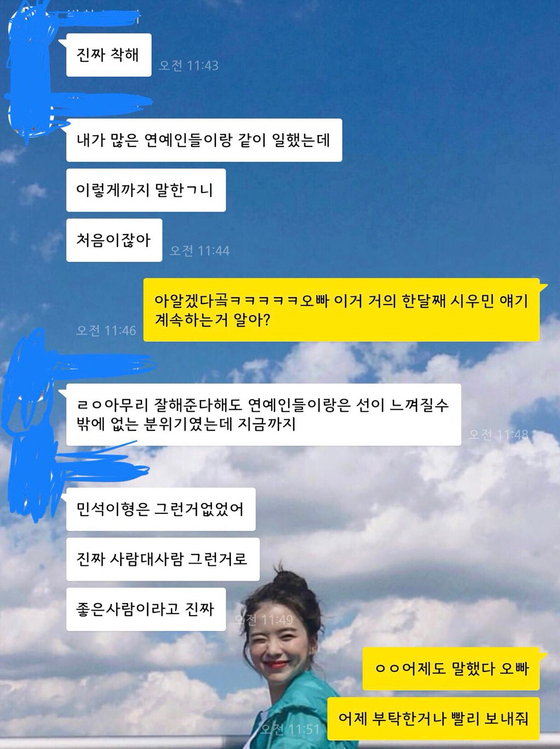 The writer who've uploaded her conversation with this "Xiumin lover" guy said "I also am a fan of Xiumin, but was too tired after listening to him talking about the same thing over and over for a month. Aside from these messages, he also mentioned many more happenings with Xiumin. Up until now, he has been working with many other celebrities, but seeing him talking about Xiumin everytime he gets drunk, Xiumin must have really good personality." People who've taken a look at these text messages responded "Everyone talks good about Xiumin. Even the company staffs, and part-time workers. Xiumin must be a good guy, for sure." 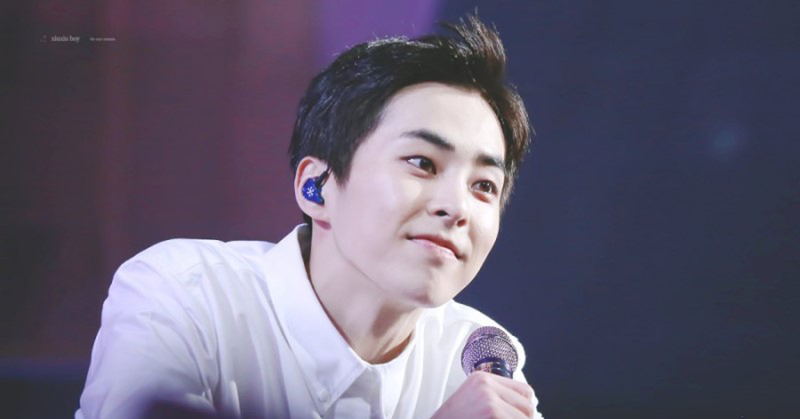 It's been said that Xiumin's outstanding visual commensurate with his attentive personality. However, this episode has confirmed once again that he is a warm-hearted and considerate person not only to celebrities but also to the general public.